Club Women's Lacrosse traveled to the Bronx, New York on Saturday, March 10th to take on the Rams of Fordham University. The Pride and Rams went into overtime tied at 9, but Linnea Barbour was able to convert and score the game winning goal for Hofstra to claim a 10-9 victory. Jessie Allendorf and Alexis Lott both scored hat tricks, while Maddie McDonagh and Sabrina Duncan also added goals. Maria Lao had a solid game in net with 10 saves. 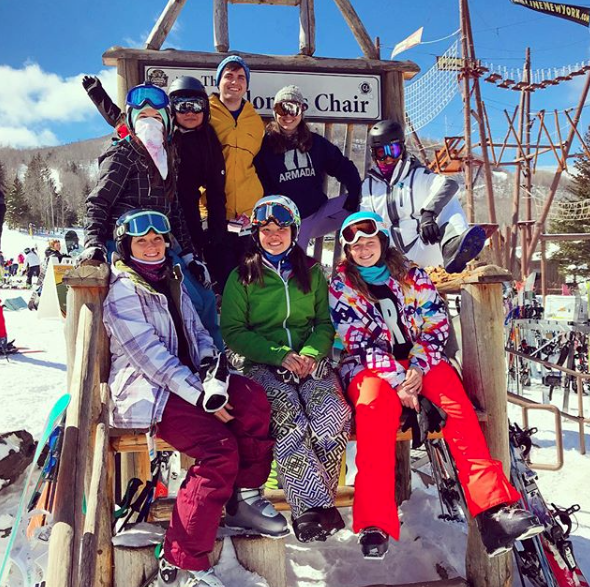 Club Ski and Snowboard traveled to Hunter Mountain in Hunter, New York on Sunday, March 11th. The Nor’easter snow storms made for perfect ski and snowboard conditions for the trip. The sun was out and the temperature was in the mid-30’s, making it comfortable to ride the entire trip. The 11 members who made the trip had a great time and are working on planning their next excursion. Club Equestrian competed at Country Farms in Medford, New York on Sunday, March 11th. Kate Milford placed fourth in novice over fences and qualified for Regionals. 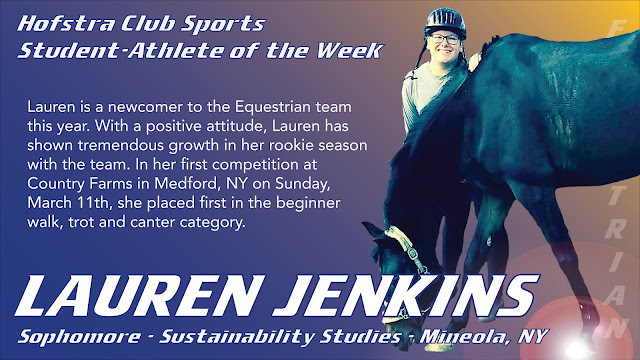 Lauren Jenkins competed in her first show and placed first in beginner walk, trot and canter. Club Women’s Rugby traveled to the Bronx, New York on Sunday, March 11th to take on Fordham and came away with a 38-12 triumph. Club Billiards hosted their tournament in the Hofstra Game Room on Friday, March 9th. James Reilly came in 1st place and Alex Oleschuk was the runner-up. Overall, 15 athletes participated in the tournament. Club Volleyball competed at the VBLI Tournament at Hofstra University on Saturday, March 10th. While both the men’s and women’s teams went winless on the weekend, they were able to gain valuable experience as they continue to grow the club. Lauren is a newcomer to the Equestrian team this year. With a positive attitude, Lauren has shown tremendous growth in her rookie season with the team. In her first competition at Country Farms in Medford, NY on Sunday, March 11th, she placed first in the beginner walk, trot and canter category. Hofstra’s 26 Club Sports are always looking for new members and welcome all experience levels. If you would like to find out more information about joining one of our clubs, please visit hofstra.edu/recreation and click on the ‘Club Sports’ tab, or feel free to visit us at the Hofstra Fitness Center with any questions you may have!